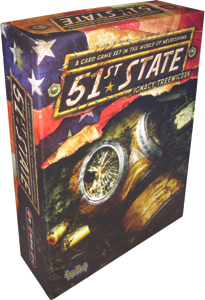 51st State, the hot new Essen release from Toy Vault and Portal Publishing, is now shipping to distributors. In this exciting game from acclaimed designer Ignacy Trzewiczek, players struggle to maintain stability in a harsh, post-apocalyptic wasteland – will you be able to lead your faction from a simple nomadic tribe to a thriving community? Can you re-start civilization? With 110 unique cards and 198 colorful cardboard tokens, players will build their factions up by means of commerce, territorial claims, or conquest. Each location provides players with new choices and options, and each leader rewards different paths. Will you follow Borgo the Almighty to glory as a conqueror, or will Mr. President guide you to reconstruction? 51st State ships 8 units per carton. Suggested retail price: $39.99. Be sure to check out ToyVault.com for more details.